This recipe will give two portions if serving with other veg. 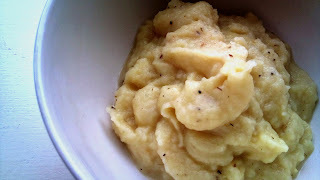 If the puree replaces mashed potatoes, make double the amount below to serve two people. • 200g of parsnips. Topped, tailed, peeled and quartered lengthways, then roughly chopped. The centre core can be a little bitter sometimes in bigger parsnips, so you should trim this away. Add the boiling water to a pot and add the stock cube. Place the steamer on top (you can use a colander if you don't have a steamer) and add the parsnips. Add the thyme and salt and cover loosely with a lid or plate. Allow to steam for 15-20 minutes until the parsnips 'give' when prodded with a knife. Remove from the heat and transfer to a high sided container ready for blitzing. Keep the stock to one side. Add the butter spread and gently mash the parsnips with a fork. 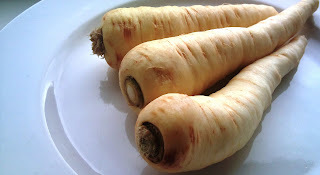 Add about 20ml of stock (about 4-5 tablespoons) and blitz the parsnips using a hand blender until creamy. You can add a little more stock if you like. Taste and add salt and pepper as needed then serve. This looks lovely. Almost like glammed-up potato.My lovely husband is a little obsessed with parsnips. I must try making this. Is it dried thyme you used? Glammed up potato.. lol! The steaming really keeps the flavour and sweetness in. I used dried thyme but fresh would make them even nicer. Although, I'd use a little less keep the flavours balanced. Let me know how you get on!